My Life changed completely when I became a travel blogger. Last year, I spent about 70% of my time traveling. That might sound like a bit much to some people but I love adventure…and it helped that I was able to do it without worrying about money. In fact, I was able to make money while I traveled, blogging as I went. One of my favorite destinations I visited was the Azores, a Portuguese archipelago of nine volcanic islands in the middle of the northern Atlantic Ocean. On the island of Terceira, known locally as the lilac island, I hiked up the remnants of extinct volcano Monte Brasil. From my vantage point at the top of my hike, I enjoyed breathtaking views of the Bay of Angra do Heroismo—and the city from which it takes its name. 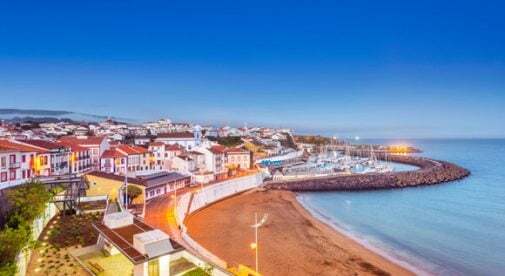 The oldest city in the Azores, Angra do Heroismo is home to a beautifully restored historic center and surrounded by rolling green landscapes. After working up quite the appetite, I enjoyed some surprisingly tasty, fresh barnacles and limpets at an ocean-view cafe, and gorged myself on alcatra—a tender beef roasted slowly in a clay pot with a savory sauce made with wine. On Pico Island, I crisscrossed through black volcanic vineyards, sampled local wines, and went spelunking at Gruta das Torres—an underground lava tube. And on San Miguel, the most visited of the Azores’ islands, I went on a whale-watching expedition, took a tour of the pineapple and tea plantations, and soaked my stress away in the natural hot springs. Because of my blog, the trip was fully comped. My flight was booked and covered entirely by the Azores tourism board. I stayed in four hotels—three oceanfront boutique resorts and one ultra-modern high-rise—all of which were booked and paid for. I was given a local guide on each of the four islands who showed me the iconic sights as well as the off-the-beaten-path areas that only locals know about. I sampled tasty meals, local delicacies and wines, all at no cost. In addition to the articles I wrote for my blog, I was able to sell some articles about my trip to other publications and blogs. After the trip, one of the resorts I stayed at asked if I would review their hotel and place an ad on my blog (for which I receive a monthly payment). I absolutely loved the resort, so this was a win-win scenario. Just last week, I was invited back to visit some of the other islands in the archipelago later this year. Confucius once said, “Choose a job you love, and you will never have to work a day in your life.” I couldn’t have said it better myself.